This week's show features a talk given by Dave Brailsford, Performance Director of British Cycling, explaining how his team achieved a record medal haul at the Beijing Olympics. 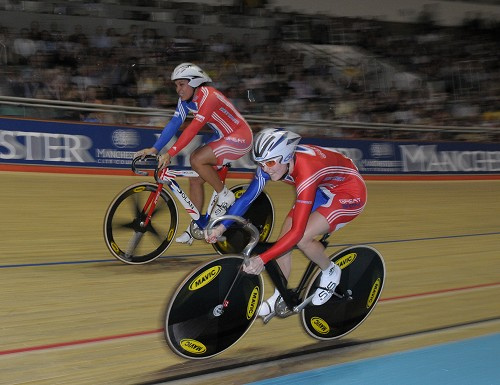 We also discover that Shanaze Reade (pictured left, racing in the team sprint with Victoria Pendleton) has never head of fixed gear freestyling despite being a world champion cyclist in both BMX and track racing. Someone who is all to familiar with the fixed wheel phenomenon is BikeSnob NYC, who regularly wins gold medals for "systematically and mercilessly disassembling, flushing, greasing, and re-packing the cycling culture". Over a few ales, the BikeSnob offers his reflections on 2008 and his hopes and fears for the coming year. We talk penny farthings, the Opinionated Cyclist and how to survive the New York winter on two wheels.